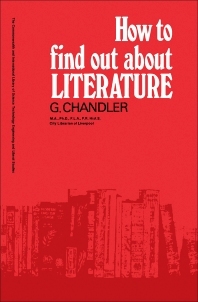 How to Find Out About Literature aims to provide a general survey of literatures and a general indication of the dates of these literatures. The book first elaborates on how to study and appreciate literature and how to trace literary works, including exercises and universal and national bibliographies. The text then examines how to trace poetry, drama, novels, and prose, foreign and subject bibliographies, library and sale catalogues, and guides to libraries, and literary information on general reference books and encyclopedias. The manuscript discusses how to trace literary information in handbooks and concordances to poetry and drama, handbooks and reference books on novelists and prose writers, dictionaries and guides to the English language and specialized subjects, essays, theses, and periodical articles. The text ponders on how to trace periodical articles and literary abstracts. The book is a valuable reference for students and researchers in their studies.